Governor Jerry Brown is pursuing a new set of targets for reducing the amount of greenhouse gas released in the state. Here’s the Associated Press write-up, and this from the Los Angeles Times. Brown’s plan is an extension of the state’s original “AB 32” goals – passed into law when Arnold Schwarzenegger was governor – that called for the state to return to its 1990 levels of carbon pollution by 2020. A follow-up Schwarzenegger plan tightened the screws even further, calling for an eighty-percent reduction by 2050. "When Hitler was marching on Germany, we didn’t have any airplane factories...we transformed the whole economy." Yesterday's executive order sets a concrete "intermediate target" between those two goals. 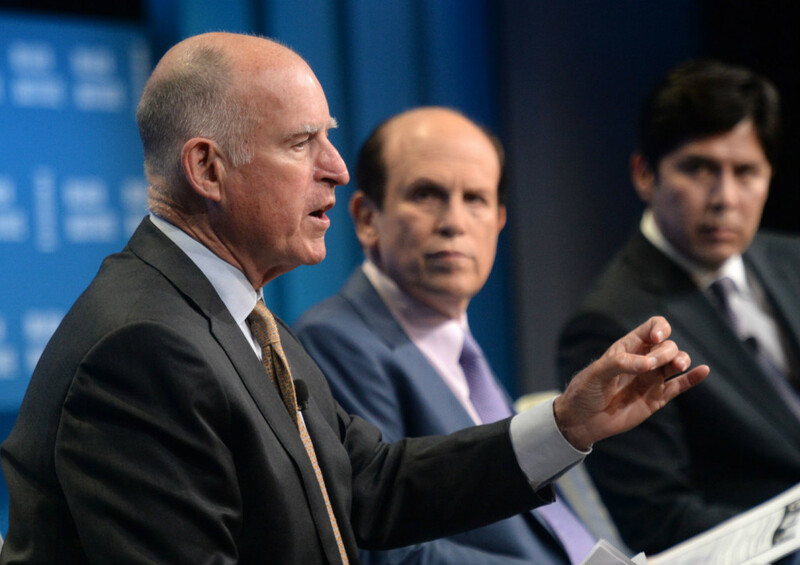 By 2030, Brown wants California – “the state of imagination” as he put it -- to be putting out 40 percent less greenhouse gas than we did in 1990. Speaking at the Milken Institute in Los Angeles, Brown compared the fight against climate change to World War II, railed against climate change deniers in Washington, and suggested Californians might need to open their minds to the idea of drinking recycled toilet water, among other things. The new plan is ambitious, sure, he said. But we’ve done it before. “When Hitler was marching on Germany [sic], we didn’t have any airplane factories going and tank factories. But with Roosevelt leading, we transformed the whole economy. Dealing with the threat of climate change is going to require an analogous mobilization." Meeting the new goals and responding to California's epic drought will require cleaner cars, greater energy efficiency, and coming to terms with new sources of drinking water that may make some Californians squeamish. "You’ve got the problems in the Middle East, Iranian nuclear deal and all that…we’ve got violence in Baltimore. Those are hot and they’re immediate. But we’ve got a slow, rolling crisis that if we don’t deal with it, before we know it we will have passed a tipping point, an irreversible tendency that will be melting the Antarctic ice cap in Greenland, raising sea level, causing temperature rises. I don’t want to go through all the parade of horribles. But it’s serious, it’s catastrophic and it’s longer term. Brown has not specified how to achieve his new emissions target. His 2030 target adds to an ambitious list of climate goals that he outlined in his State of the State address in January.